Situated along the south west coast of Majorca in the Balearic Islands, Santa Ponsa is a buzzing resort packed with bars, restaurants and entertainment running throughout the day and night. The south coast of Majorca is known for its party lifestyle, but Santa Ponsa strikes a balance between the crazy nearby resorts of Palma Nova and holiday destination Magaluf, and the quieter resorts of the northern coast, making a Santa Ponsa holiday the perfect holiday for families wanting to please everyone. As with other resorts across the island, you can expect fantastic weather and phenomenal beaches on your holiday in Santa Ponsa. If you want to escape the crowds a little, there is a more secluded beach, ‘Little Beach’, only ten minutes walk away: Try jet-skiing or windsurfing here if you don’t want to be seen falling off! Both beaches offer shallow and safe waters, so you don’t need to worry about the children. As you’d expect from an island, there are various different boat tours on offer but if you’re feeling a little more adventurous you can hire your own motor yacht and explore some of Majorca’s stunning coastline - offering an excellent family day out and a chance to spend some quality time together on your Santa Ponsa holiday. If you prefer to be under the water than on top of it, Santa Ponsa boasts a PADI qualified diving school, or grab a snorkel and explore for yourself. Santa Ponsa holidays are not short of non-beach activities either. 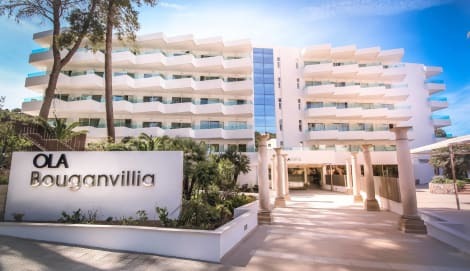 Hire a mountain bike and explore the local area, visit the local riding club, play a round or two of golf - or mini golf for the kids, hire a tennis coach and improve your backhand and, after all that, visit the Santa Ponsa Spa. If you need a break from the kids, leave them at a kids club for the afternoon and relax in peace. If you get a chance to explore more of the island there are a number of brilliant activities only a short way off and buses run to and from the resort run regularly. The Western Park is particularly worth visiting, offering both a water park and a Wild West theme park that guarantees to thrill the entire family. In the evenings the resort really comes alive, although not to the extent of neighbouring resorts. Offering a vast array of bars and restaurants with quiz nights, themed parties, live music and kids games, there’ll never be a dull moment on your Santa Ponsa holiday. We can’t guarantee that you’ll remember your sunglasses, avoid stupid tan lines, or tennis coach yourself to Wimbledon, but Santa Ponsa holidays have all the other ingredients for success. Book today with lastminute.com and enjoy your holiday knowing that it was not only incredible but also that it was incredible value. Book your Spain holiday today.